Ethan Miller/Getty ImagesHuawei CEO Richard Yu. 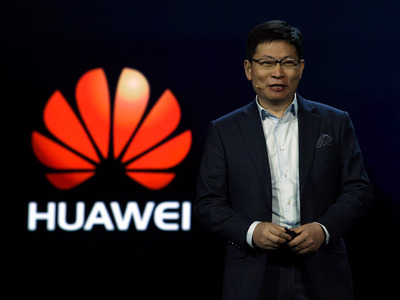 Huawei has overthrown Apple as the world’s second largest smartphone maker behind Samsung, according to new research by analysis firm Counterpoint Research. August sales aren’t out yet, but June and July numbers show Huawei surpassing the Cupertino, California giant. Counterpoint said August are “looking strong” so far. Its astonishing growth, Counterpoint Research says, is largely due to “its consistent investment in R&D and manufacturing, coupled with aggressive marketing and sales channel expansion”. Chinese brands like Huawei largely rely on direct sales, where the consumer buys a handset directly. That’s why it has conventionally struggled in the US market, where the carrier-based model dominates. Counterpoint ResearcHuawei surpassed Apple in both June and July 2017 sales numbers, and Counterpoint Research says it’s likely to be above in August numbers. 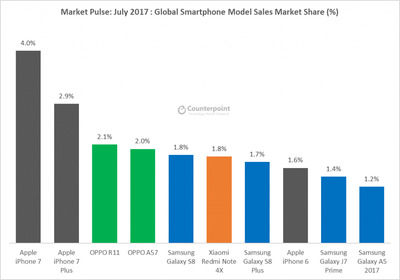 How has Huawei managed to overtake established rivals like HTC, LG, and Sony in all these markets? According to Counterpoint, Huawei and other Chinese brands like Oppo, Vivo, and Xiaomi have consistently managed to “outsmart and outspend” the competition. Huawei is facing two main problems — one is short-term, and the other is a bigger problem encompassing its strategies and business model as a whole. The first issue is Apple’s imminent announcement of the new iPhone lineup, which is said to include a special, tenth-anniversary edition model that could entail a big change in design and functionality. 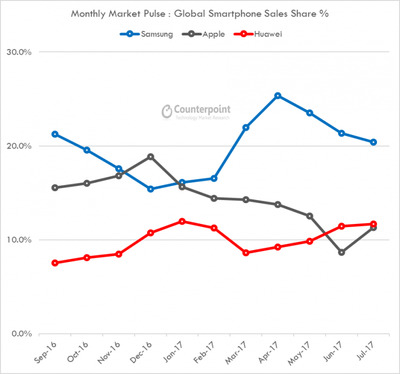 Counterpoint ResearchSpeaking of individual phone models, Huawei is nowhere to be seen in the top ten, with Apple’s latest iPhone models still dominating the charts. 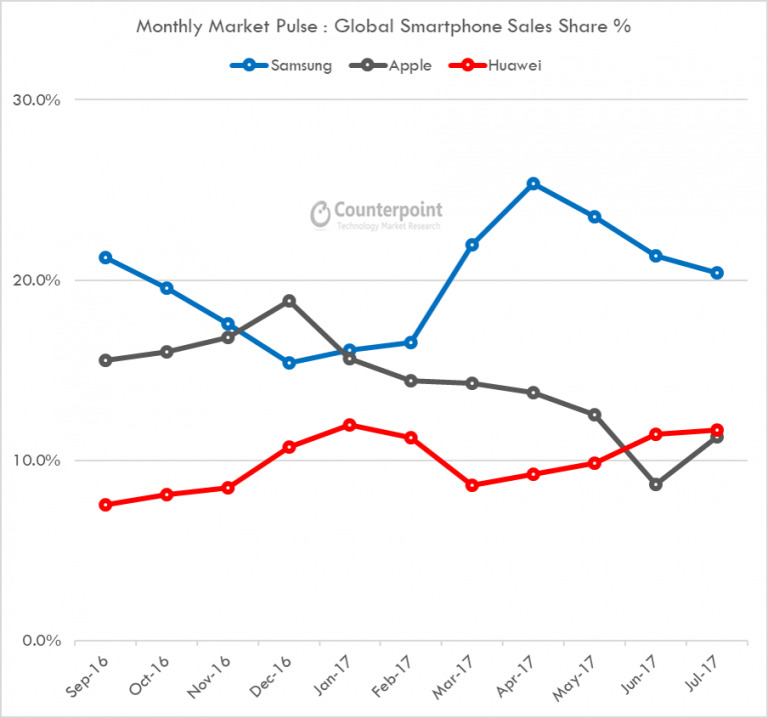 Counterpoint Research largely expects this to be a strong reason why Apple has temporarily lost its momentum, whereas Huawei’s most recent flagship, the P10 (and P10 Plus), launched just months ago. The thinking is that loyal Apple consumers have been hanging on to their old handsets, waiting to upgrade to the new device. The other problem is Huawei’s broader marketing strategy, which sees a myriad of handsets making up for its increased market share collectively, rather than “hero devices” that single-handedly push the brand forward. This is why, according to Counterpoint Research, the Chinese firm doesn’t have any single model in the top ten ranking of best-selling devices, still wildly dominated by Apple’s iPhones. “While having a diverse portfolio allows Huawei to fight on multiple fronts, it does little to build overall brand recognition; something Huawei badly needs if it is continue to gain share,” said Pavel Naiya, a senior analyst at Counterpoint Research.